Penthouse view of beach ! Only 2 weeks left in July ! Book now ! Spend your summer vacation at the Abacos in Santa Rosa Beach! What a great time to be at the beach! Book it now! Great rates!Penthouse level view! Just steps from the beach! Pool! Our condo has been recently painted and redecorated! Luxurious accommodations and unsurpassed, top floor gulf views await you at this elegant condominium located in the complex of 'Abacos' in Santa Rosa/Dune Allen Beach. Sitting right across from the community of Sunrise Beach, a short walk to the community of Gulf Place and only steps to easy beach access at Ed Walline Park, you will be delighted with your convenient location. Enjoy our speciality ice cream/candy shop, craft beer store , beach gift store and nail spa located on the ground level. This Abacos penthouse unit is complete all on one level making it appealing for young and old alike - no stairs to climb and an elevator to take you to your door. Professionally decorated with tasteful furnishings and many unique touches, including a tropical wall mural that greets you as you enter. Relax in the spacious living area with 60' flat-screen TV, or step out onto the adjacent balcony to enjoy the incredible views and fragrant gulf breezes. A fully-equipped, upscale kitchen with granite counters and stainless appliances makes meal preparation a pleasure, while six can dine comfortably in the adjoining dining room with adjacent bar area. Three attractive bedrooms include the master suite with a Queen bed,32 inch flatscreen, and a private bath plus two guest bedrooms, one with a Queen bed and the other with a Full bed, that share a hall bath. A half bath is available to the living area. TV/DVD/VCRs in living area and all bedrooms. Wireless Hi-Speed Internet. Relax by the beautifully designed and privately located pool with dolphin fountains and ample sunning areas. Walk to numerous shops and restaurants convenient to your location and only 10 minutes to Silver Sands Outlet Center. Take advantage of the activities and events at Gulf Place, where something is always happening. Elevators. Parking for two cars. Saturday to Saturday rental. Will accept 4-day rentals in spring and fall. We had been vacationing in this area 10 years prior to purchasing our condo. We LOVE Santa Rosa Beach! We enjoy the biking trails and being within walking distance of restuarants and shopping! The beaches are clean and SAFE!! It is such a family friendly area!! We have a beautiful view from our penthouse level condo. 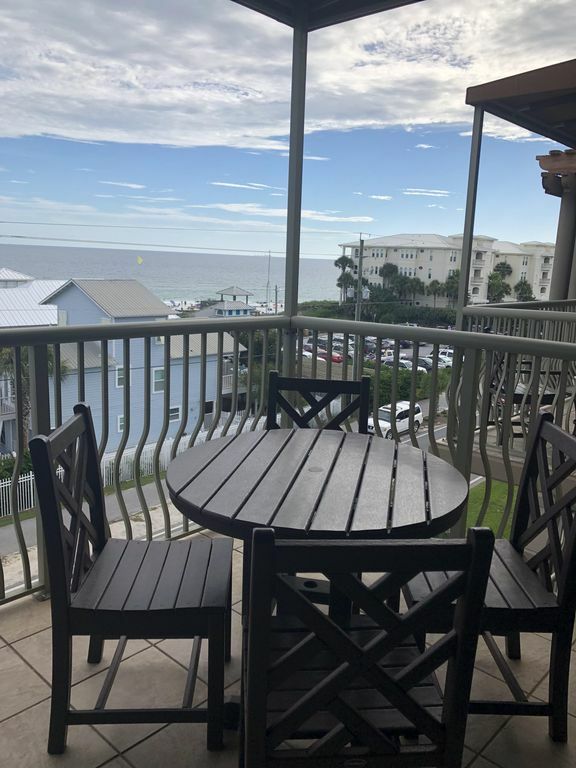 We have 2 balconies to sit back on and see the Gulf!We are just steps away from the beach!Our condo is professionally decorated with ' upscale beach decor'! Relax on the balcony with your morning coffee and see the ocean! Bring your laptop and use our FREE WiFi!! Designer chaise/sofa combination, coordinating chair/ottoman . Accessorized with beach decor. Dining table for six. Three new leather/iron barstools at the granite bar. 65 in flatscreen in LR in a customized rattan / wood wall unit. We totally enjoyed our stay at 402 Abacos! The location was perfect with easy beach access, gift shops, bike and board rentals, and fabulous restaurants. The view from our balcony was breathtaking! Great location. You can walk everywhere here and beach right across street! Condo was great and the location is ideal. Restaurant right next-door and Gulf Place market right across the street with shopping and restaurants amd the public beach access is directly across the street so we never drove anywhere hardly! It was great. Would stay here again for sure!! Cc Great place for families. The beach and water were beautiful. Have been going for many years and was never disappointed. Thank you for your great review ! It’s not just a rental , it’s our vacation home also ! So we really try to make our guests comfortable! Super Happy With This Condo !!! We usually stay in Destin/Miramar Beach, so this was our first time staying on 30A. This condo and 30A were everything we hoped for. The condo is very nicely decorated and right across the street from the public beach. Large screen TV in the family room and a sofa so comfortable that we wrote down the brand/type so we can get one for our home. The kitchen has nice appliances and plenty of cookware. The 2 balconies were great to sit out on and enjoy the view of the beach and people watch 30A. Plenty of great restaurants, bars, and retail in the building and within walking distance. It was a truly relaxing vacation and we are already looking forward to going back. Thank you for your great review ! We own a furniture store , so we take pride the furnishings and how comfortable they will be for our guests . Thank you for choosing our vacation home . The condo was perfect! Beautiful view of ocean and a great location - steps away from the beach and restaurants. Gorgeous furnishings and very spacious! Couldn’t have asked for a better place to stay! Thank you! January and February are the only monthly rentals ...$1700 per month.